So how can you turn Kool-Aid into Jello? Easy! 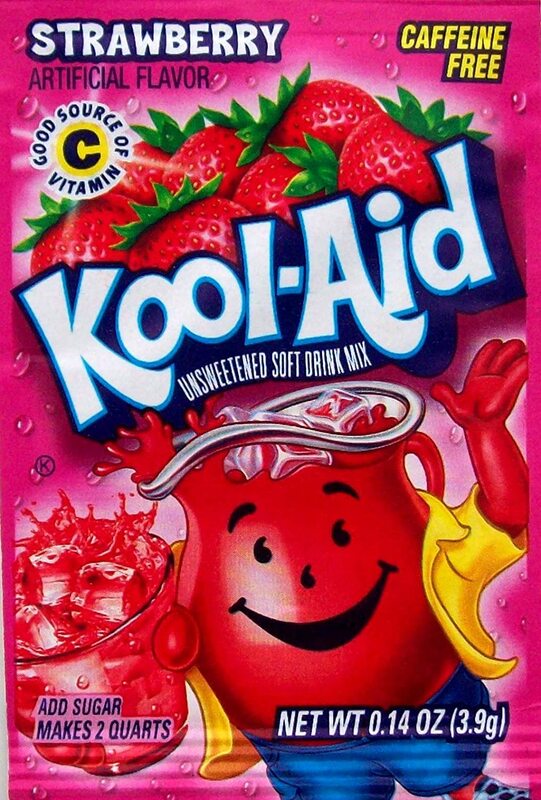 1 packet Kool-Aid, your choice of flavour, as long as it’s strawberry – just kidding! To a large bowl or a jumbo measuring cup (seen above! ), add 1 cup of cool (room temperature is fine) water. Sprinkle all the gelatin over top and allow it to soften for 5 minutes. Bring 2 cups of water to a boil. You’ll need this in a minute. Add Kool-Aid packet contents and 1/2 cup sugar to the jellied water from Step 2. Pour in 2 cups boiling water and stir well for 2 minutes until both Kool-Aid, sugar and gelatin are completely (Important! ALL THE WAY!) dissolved. Taste it at this point to make sure it’s sweet enough. Add a little more sugar if needed. Add 1 cup very cold water (or ice cubes) and stir vigourously. Pour into a container to set or into individual serving cups for a more parfait-style presentation. You can also allow your Jello to set up a little and then do creative things with it like using cut-up stale cake (into cubes) and pareve whipping cream to make trifle. Yummy! Feel free to put fruit in the Jello when it’s almost all the way set (so the fruit doesn’t just fall to the bottom) except pineapple and kiwi, which will stop the gelatin from gelling. This is the one plus of those kosher-brand jellos, that you can make them even with these 2 fruits. But to me, that’s not a huge advantage. Red Jello is just the first step in what I call “puffy pie,” my absolute most favourite dessert ever. Maybe I’ll share that one with you sometime, too…!